HENNGE One apply to ZIP 2.0 compatible encryption "traditional PKWARE encryption" format, it change the attachment file to password protected zip file and send email automatically. You can set up whether encrypt or not with filtering settings or encryption setting. In addition, you can choose "Fixed Password" or "Random Password"
Therefore, There are some options.For instance, you can use "Fixed Password" when you send a email with attachment file to particular customer, or, you do not encrypt attachment file when you send a email to particular recipient. In this step, encryption rules that you set up in "Filter" - "Define Filters" are applied to email with attachment file. step2 - Confirm "File Extensions Skipped Encryption"
Check the File extensions If there are file extensions you want to exclude from encryption processing. In this step, encryption policy that you set up in "Encryption" - "Define Encryption Policy" are applied to email with attachment file. Encryption policy consists of the combination of "Sender", "Recipient" and "Encryption Type", and is applied in order of priority. you can set "Sender" and "Recipient" that are created in "Filter" - "Define Mail Group". This article consists of instructions on how to properly configure and customise the settings in Password Protected Zip File Encryption in order to best suit the environment of your organisation. 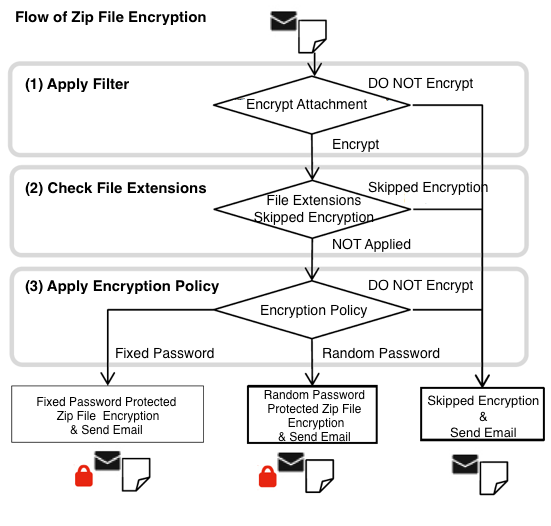 There are three parts of settings in Email DLP Admin Guides: Data Loss Prevention Settings, Sending Approval Settings and Password Protected Zip File Encryption Settings. As for this particular article, only the Password Protected Zip File Encryption Settings will be explained. The Sending Approval Settings and Password Zip File Encryption Settings can be found in separate documents. ☆ 1 - Click "Encryption" - "Define Encryption Type" in the left pane, and click "New Encryption Type" in the toolbar. ☆ 2 - Enter "Encryption Type Name" and "Comment". 1) Encryption Type Name : Enter any name of Encryption Type Name. 2) Comment : Enter any explanation of Encryption Type Name. ☆ 3 - Select "Password Type". 1) Password Type : Specify a type of password which is used for automatic attachment encryption. Fixed Password : A password in fixed format will be used. A notification message for recipient is not sent if fixed password is used. Random Password : A randomly generated password is used as default encryption. However, you can switch notification message for recipient. Alphabet : Upper case and Lower case. 1) Generate password individually : If you select "Random Password", check "Generate password individually". 2) Notification Message (for Recipient) : Specify the notification message sent to the recipient. ☆ 6 - After setting "Generated ZIP Extension", click "Register". ☆ 7 - Depending on your need, you can delete the "Encryption Type" by checking the type and push "Delete" button. *Note - When you delete a Encryption Type, the Encryption Policy that this type depends on is also removed at the same time. ☆ 1 - Click "Encryption" - "Define Encryption Policy" in the left pane, and click "Add Encryption policy" in the toolbar. ☆ 2 - Set "Priority" value. 1) Priority : It must be between 1 and 99999. A lower value corresponds to a higher priority. 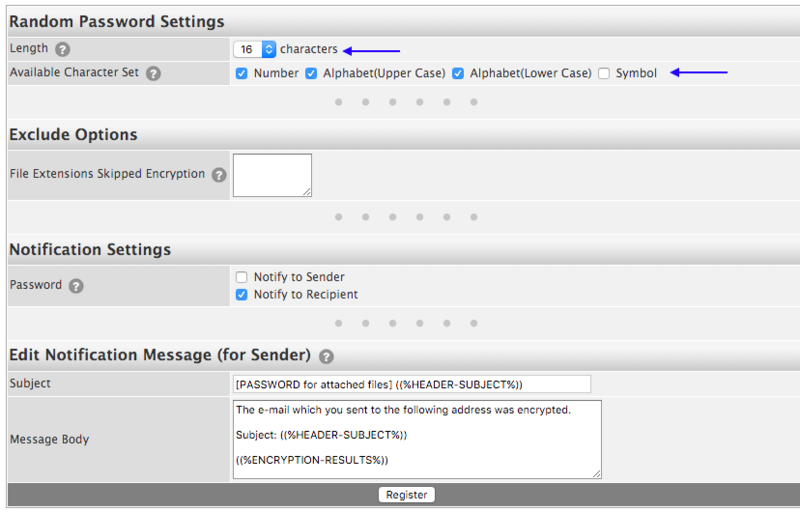 ☆ 3 - Select values of "Sender" and "Recipient". 1) Sender : Judged by the SMTP envelope sender value rather than the value of the From: header. You can create a mail group in "Define Mail Group" menu if you want to register email addresses to be applied an Encryption Type. 2) Recipient : Judged by the SMTP envelope recipient value rather than the value of the To: header. You can create a mail group in "Define Mail Group" menu if you want to register email addresses to be applied an Encryption Type. 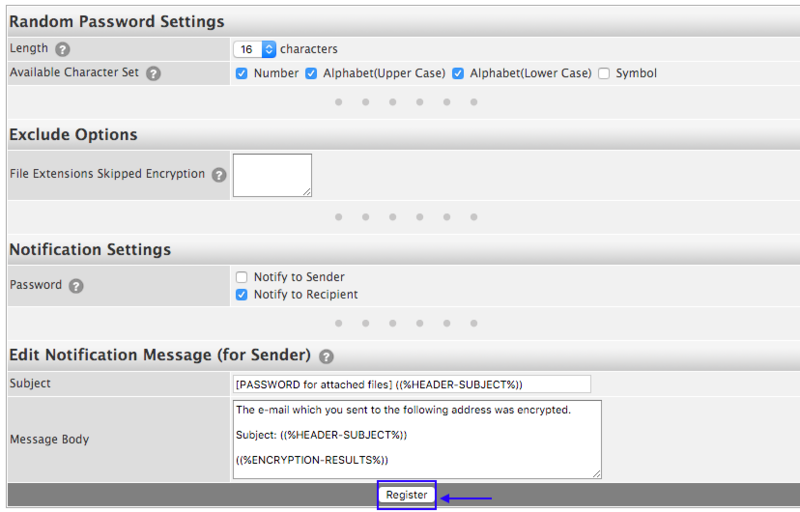 ☆ 4 - After setting "Encryption Type", click "Register". 1) Encryption Type : You can create a Encryption Type in "Define Encryption Type" menu if you want to make it. ☆5 - Depending on your need, you can delete the "Encryption Policy" by checking the type and push "Delete" button. ☆ 1 - Click "Encryption" - "Common Settings" in the left pane. ☆ 2 - Set up "Length" and "Available Character Set" in the "Random Password Settings" field. 1) Length : Specify the length of the random password. Max value is 30 characters and Minimum is 8. 2) Available Character Set : The password is generated by random combinations from the selected character sets as below. ☆ 3 - Enter "File Extensions Skipped Encryption" in the "Exclude Options" field. 1) File Extensions Skipped Encryption : If there are file extensions you want to exclude from encryption processing specifically, you can specify their extension. The encryption is not applied to attachment files with the specified extension. ☆ 4 - Specify whether the password notification message is sent to the sender or the recipient. 1) Notify to Sender : This notification is always enabled while Single Sign-On is disabled in "Account"-"Single Sign-On" menu. Even if this notification is disabled, the sender can check the information in "Encryption"-"History" menu. please refer to this link : HENNGE Email DLP User Guides2) Notify to Recipient : If the notification is disabled, notification message is never sent to the recipient regardless of Encryption Policy settings. 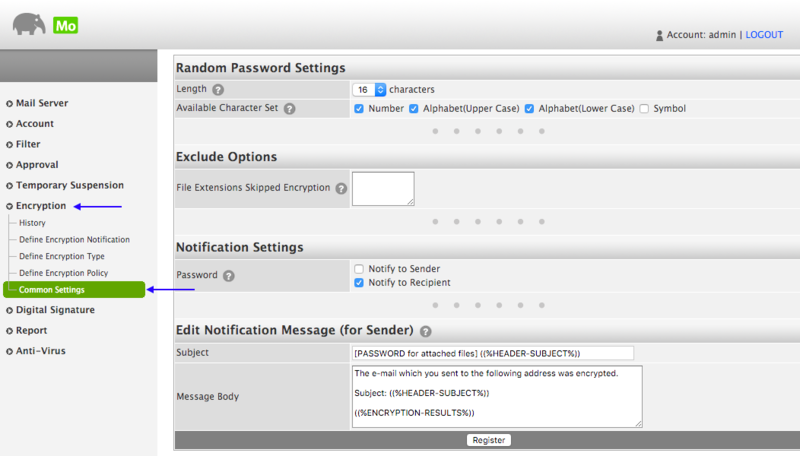 Then, the sender has to tell the recipient what the password is somehow or other. ☆ 5 - Depending on your need, you can modify a template of the message body to inform the random password which can be used to extract the encrypted attachments. ☆ 6 - Click "Register" button.